Sandy Colbs and Levester Johnson with Colbs’ award. 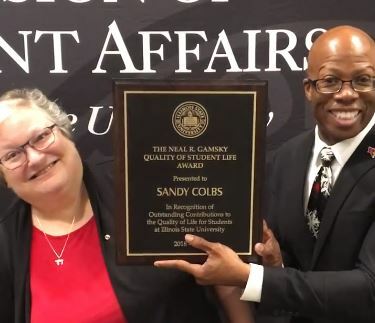 Director of Student Counseling Services Sandy Colbs is the 2018-2019 recipient of the Neal R. Gamsky Quality of Student Life Award. She will be honored at the Founders Day Convocation on February 21. Colbs received a bachelor’s degree from Rhodes College and a master’s degree and Ph.D. from Southern Illinois University at Carbondale. She came to Illinois State in 2001 to serve as director of Student Counseling Services. Some of Colbs’ most notable accomplishments in this role include continually reviewing clinical service delivery systems and processes, establishing a University infrastructure to address high risk drinking, securing grant funding to develop a suicide prevention program, creating the first case manager position on campus, and initiating the Stepped Care Model, which addresses the increased need for individual therapy, group therapy, and workshops. Colbs serves on numerous University committees, including the Campus Climate Task Force, Mental Health Task Force, Redbird Care Team, and Student Affairs Council. Additionally, she holds an adjunct faculty appointment at Illinois State and an adjunct assistant professor appointment at the University of Illinois Urbana-Champaign. 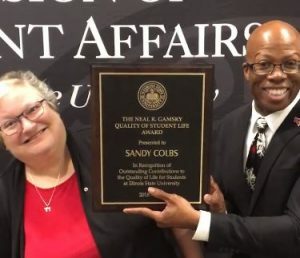 Colbs has previously been recognized through the Division of Student Affairs STAR Awards and also received the President’s Award from the Association for University and College Counseling Center Directors. She is a frequent presenter at regional and national conferences, allowing her to bring innovative, best practices back to campus where they can be adopted, adapted, and implemented. Providing the best services and creating the most inclusive environment is Colbs’ top priority. Advocacy informs her decision-making and leadership, and social justice lies at her core. Colbs uses this passion to support ongoing professional development of cultural competency and in her own work with members of the LGBTQIA+ campus community. Under her leadership, students have been positively impacted; their whole selves have been considered, and all decisions are made from a place of how it will benefit students.